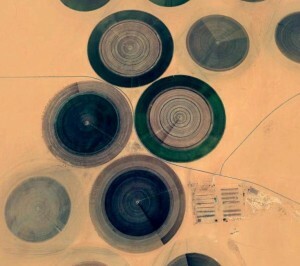 A satellite image of the agriculture project in Libya’s southern city of Al Kufra fed by fossil water. These single pivot irrigation projects supplied much of Libya’s grain production prior to the 2011 revolution and would need to be reactivated if Libya is to reduce its grain imports substantially (Photo: social media). Libya’s grain production could increase by 600 percent and provide 50 percent of local consumption in the 2018-19 season, Libya’s Ministry of Agriculture has said. Abdelmonem Shahabedine, the Chairman of the Presidency Council’s Ministry of Agriculture’s Steering Committee, told the Tripoli-based Libyan state news agency LANA, that Libya would need to import 1.1 million tons of grain to cover this year’s estimated consumption of 1.2 million tons. Libya produced only 100,000 tons last season. However, Shahabedine said that Libya’s agricultural sector could meet half of next season’s needs by producing as much as 600,000 tons – if security and electricity supply improved. To meet this ambitious production target Shahabedine said that US$ 120 million would need to be invested in the agricultural sector, of which more than US$ 10 would go to seed imports.